Every month we manufacture a huge range of wire-to-wire and wire-to-board multi-pole crimp assemblies, in both small and large batch sizes for a wide array of customers across many industry sectors. We hold tooling for practically all popular ranges by the major manufacturers including AMP, Harwin, JST, Molex, etc. 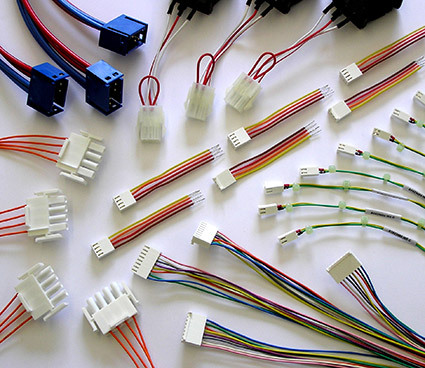 In addition we also have expertise in many specialist ranges such as the Molex 1.25mm PicoBlade™ and Harwin's M80 range, etc. Use of auto and semi-automated machinery together with our strict quality program ensures terminations are always made to exact manufacturer specifications. So no matter if it's a small single wiring assembly or a complex multi-point wiring harness customers are assured of dependable performance throughout the lifetime of the product. We carry "in-depth” stock levels and our technicians are always available to provide help and advice at any point during your products development and manufacturing cycle.